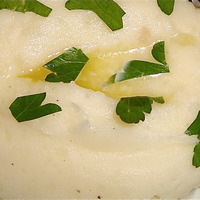 Super close-up: almost smooth, you can see some texture, hints of the roasted garlic, nutmeg, pepper. Too bad you can't smell it - it is good! This is both very flavorful and versatile, pairing with red meat dishes and fowl. If you cannot obtain elephant garlic, just buy the biggest bulbs you can find. Please try to locate white cheddar and avoid the yellow or orange cheddars. 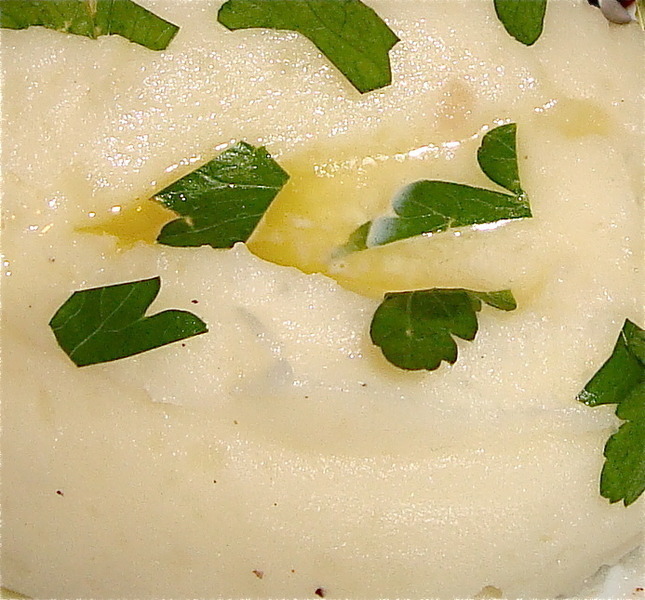 While some may be flavorful, we're going for an appearance that will deceive the diner into thinking "plain old mashed" - and don't forget that the coloring is added, not natural. You're going to say, "Amos, you haven't clearly stated the exact amounts I'll need!" Well, I am just going to assume you know how many folks you will have to feed and, if they are family, how much they might like this dish. So you will have to use your chef's intuition a bit here. This is a wonderful dish. I hope you will enjoy it as much as the people I feed do. Preheat your oven to 400^. I'm so with your kind of cooking Amos. Can you tell how much I love cheese?